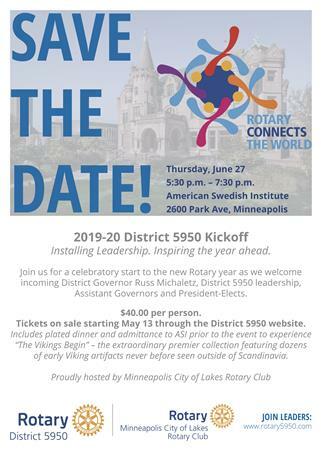 Our very own Russ Michaeltz will be the 5950 District Governor for the 2019-20 Rotary year. Please join us to kickoff the year with Russ and leadership throughout the district. As the host club, the event is free for all City of Lakes members. Registration will begin on May 14 and will be available through the District 5950 website.